Whereas most musicians would prefer to program their beats on a computer, Koka Nikoladze has elected to take a different approach. 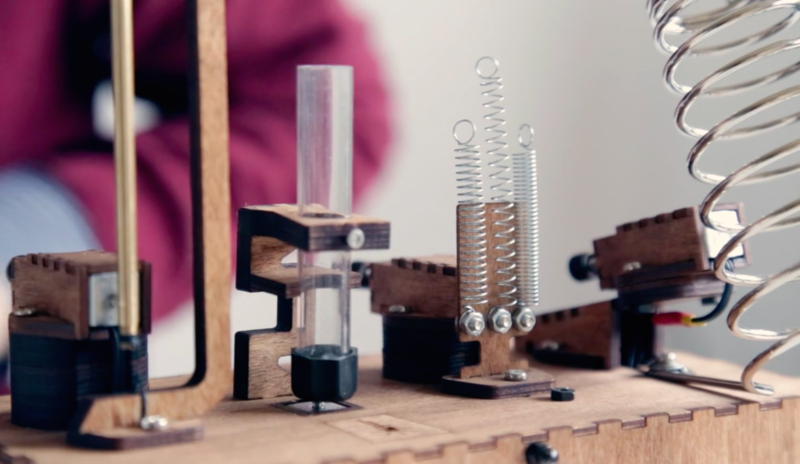 The Norway-based violinist/composer/tech developer is the inventor of handmade analog beat making machines that use springs, coils, wood and metal to create sounds. The instruments — known as Koka’s Beat Machines — are manually programmable to produce different kinds of rhythmic and melodic patterns. The newest member of the family is a bit more electromechanical, featuring an Arduino to amplify the notes and connect the various components inside the device’s wooden housing. There’s also a light on the front that flashes to each unique beat. You can watch the second of Koka’s Beat Machines in action below.